Before we take up the discussion of linear regression and correlation, we need to examine a way to display the relation between two variables x and y. The most common and easiest way is a scatter plot. 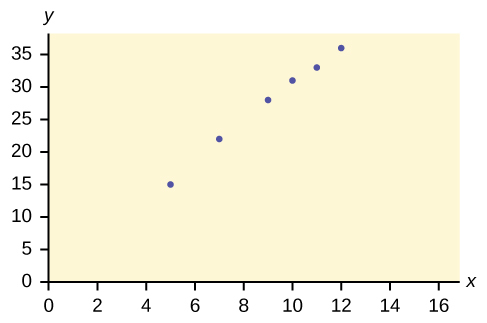 The following example illustrates a scatter plot. there a relationship between the year and the number of m-commerce users? Construct a scatter plot. 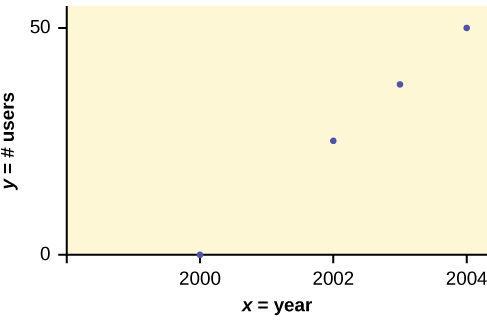 Let x = the year and let y = the number of m-commerce users, in millions. Table showing the number of m-commerce users (in millions) by year. Scatter plot showing the number of m-commerce users (in millions) by year. Enter your X data into list L1 and your Y data into list L2. For TYPE: highlight the very first icon, which is the scatter plot, and press ENTER. For Xlist:, enter L1 ENTER and for Ylist: L2 ENTER. For Mark: it does not matter which symbol you highlight, but the square is the easiest to see. Press ENTER. Make sure there are no other equations that could be plotted. Press Y = and clear any equations out. Press the ZOOM key and then the number 9 (for menu item “ZoomStat”) ; the calculator will fit the window to the data. You can press WINDOW to see the scaling of the axes. Construct a scatter plot and state if what Amelia thinks appears to be true. Yes, Amelia’s assumption appears to be correct. The number of points Amelia scores per game goes up when she practices her jump shot more. High values of one variable occurring with high values of the other variable or low values of one variable occurring with low values of the other variable. High values of one variable occurring with low values of the other variable. or to some other type of function. For a linear relationship there is an exception. 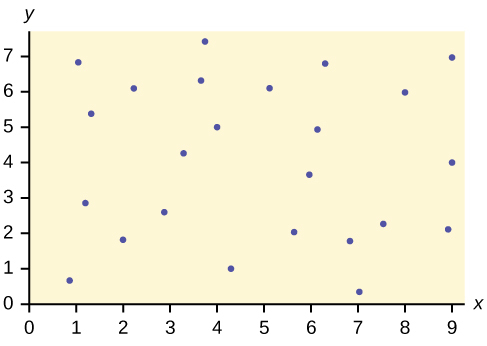 Consider a scatter plot where all the points fall on a horizontal line providing a “perfect fit.” The horizontal line would in fact show no relationship. 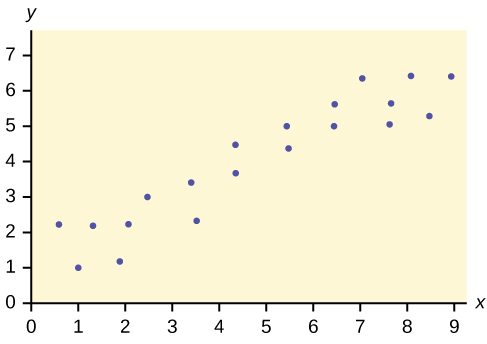 When you look at a scatterplot, you want to notice the overall pattern and any deviations from the pattern. The following scatterplot examples illustrate these concepts. Scatter plots are particularly helpful graphs when we want to see if there is a linear relationship among data points. They indicate both the direction of the relationship between the x variables and the y variables, and the strength of the relationship. We calculate the strength of the relationship between an independent variable and a dependent variable using linear regression. Does the scatter plot appear linear? Strong or weak? Positive or negative? The data appear to be linear with a strong, positive correlation. The data appear to have no correlation. The Gross Domestic Product Purchasing Power Parity is an indication of a country’s currency value compared to another country. [link] shows the GDP PPP of Cuba as compared to US dollars. Construct a scatter plot of the data. Does the higher cost of tuition translate into higher-paying jobs? The table lists the top ten colleges based on mid-career salary and the associated yearly tuition costs. Construct a scatter plot of the data. For graph: check student’s solution. Note that tuition is the independent variable and salary is the dependent variable. If the level of significance is 0.05 and the p-value is 0.06, what conclusion can you draw? If there are 15 data points in a set of data, what is the number of degree of freedom? Scatter Plots by OpenStaxCollege is licensed under a Creative Commons Attribution 4.0 International License, except where otherwise noted.